I know, I know. It’s been ages since I last wrote. In fact, it’s been almost a year. Can you believe it? I can’t. It’s a long story. You can find the brief version in the updated “About Emily” section of the blog. 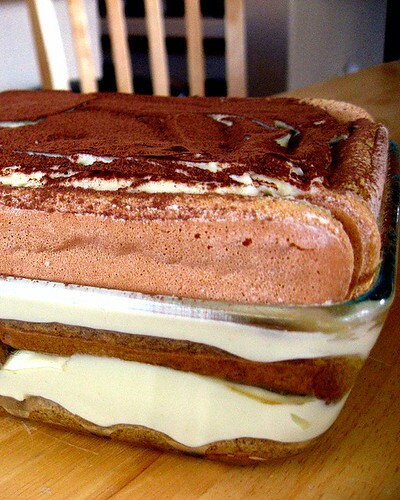 However, until I find more time to explain myself, I thought I would dive right back and share my new Tiramisu recipe! 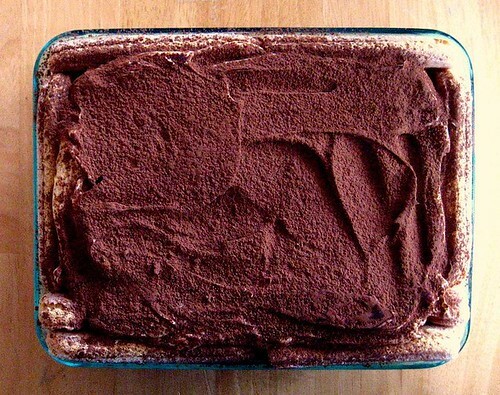 Looking back over the blog, I noticed that one of my earliest entries (back in 2009) was a recipe for Tiramisu. 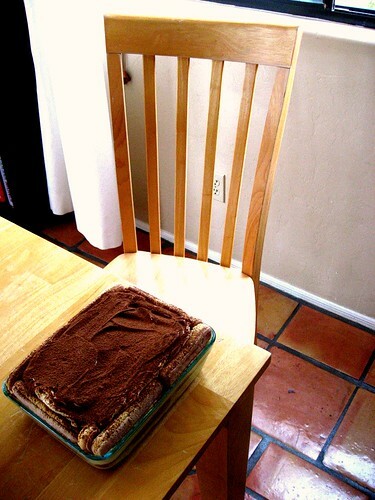 That Tiramisu tasted delicious, but as I looked over the recipe, it just seemed too complicated. I was thinking about Tiramisu because it’s New Year’s eve, and Kirk and I are making an Italian dinner. He’s doing his mom’s lasagna (which, as of this writing, is making the house smell amazing), and I wanted to make a Tiramisu. Looking over my old recipe, I decided I just didn’t have the energy for it. It was just too many steps! There had to be an easier way. In the past several years that I’ve been cooking, I’ve learned that simple is often better, and so I started scouring the internet for authentic recipes that wouldn’t kill me. As I looked through probably 30 recipes, I started to feel overwhelmed – how can I know which one will be best? They all have slightly different ratios of ingredients, and most of them had some mixed reviews. Ugh. Darn you Internet – you do not always make my life easier. I eventually decided to wing it. I knew I would need the basics – egg yolks, sugar, heavy cream, mascarpone cheese, ladyfingers, and some sort of coffee/alcohol mix. I told myself that it couldn’t be that hard. And actually, it wasn’t! It took me about an hour from start to finish, and it probably could have been closer to 45 minutes had Kirk and I not been sharing the kitchen for our various preparations. Anyway, trust me when I tell you that this recipe is actually pretty easy, and will give you a Tiramisu that’s to die for. Fair warning: the recipe is a bit boozy. I used Kahlua, so it actually added a richness that I think straight brandy would have missed. However, if you’re sharing this with kids, you might want to cut back on the liquor and focus on the coffee (not that kids need an excess of coffee either…). I’m not going to lie. While I was making this I may have licked both my spatula and whisk clean. The cheese and custard mix is not something to mess around with – you will get addicted if you sample it. Pull out an 8×8 glass dish (mine wasn’t quite 8×8 but I made do, but I can tell that 8×8 would probably be best). Fill a large bowl with ice water (trust me, you’ll need this about half-way through). Make the custard: Using a double boiler, whisk the egg yolks and sugar in a heatproof bowl set over a pot of simmering water until the sugar dissolves. Continue whisking as the mixture heats up (you don’t want to end up with chunky pieces of cooked egg yolk in your custard!). Once the sugar has completely dissolved (after about 10 minutes), slowly whisk in the cream and continue to cook, whisking constantly, until the custard is light and slightly foamy, for about another 10-15 minutes. Immediately remove the bowl from the saucepan and set in the bowl of prepared ice water – whisk the custard until it is cool (about 1 minute). At this point, you’ll really feel the custard start to firm up. Put the mascarpone in a large bowl and fold the custard in using a rubber spatula until almost combined, then whisk the mixture until it’s just smooth (do not over mix it – most of the recipes I looked at said the custard/cheese mix can get grainy if over mixed). Arrange a single layer of ladyfingers in your Tiramisu dish. Spread one-third of the mascarpone custard over the ladyfingers. Repeat with a second layer of espresso-dipped ladyfingers, arranging them in the opposite direction. Top with another one-third of the custard. Repeat with the remaining ladyfingers, alternating directions. Spread the remaining custard on top and dust with the cocoa powder. Cover with plastic wrap and refrigerate the whole thing for at least a few hours. Mine sat for about 6 hours and ended up being delicious. Just before serving, shave curls of chocolate on top (you can use a microplane for mini-shavings, or a veggie peeler for larger curls – I used my microplane).